Date A Live is a series of manga light novel series written by Tachibana Koshi and illustrated by Tsunako. The series was adapted into anime in March 2013 and a second season aired in April 2014. 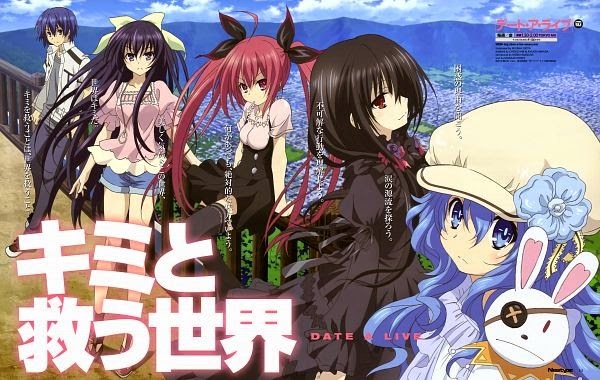 The opening theme is titled "Date A Live" sung by Sweet Arms, a vocal group consisting Iori Nomizu, Misuzu Togashi, Kaori Sadohara, and Misato. The series makes use of four ending themes: "Hatsukoi Winding Road", by Kayoko Tsumita, Risako Murai and Midori Tsukimiya; "Save The World", "Save My Heart" and "Strawberry Rain", all three by Iori Nomizu.